Imagine that all the most interesting/infamous people and religious/geopolitical situations from the 1200’s through the early 1500’s existed and happened contemporaneously. Also imagine that the world oozes with dark godlike powers and beings. That’s pretty much the worldbuilding behind Glen Cook’s Instrumentalities of the Night series. If you don’t know your Medieval Crusader-era history, you can easily become hopelessly lost in the bewildering tangle of politics and religion that drive the plot. Even if you do know that history, it takes a while to sort things out since Cook has renamed all of the people, places, and religions. At the end of this post I’ve listed the identities of some of the major players as far as I can figure them out (and you can find similar lists elsewhere). I didn’t bother with individuals since some of them seem to be composites of a few people (though there are clear analogues to Rodrigo Borgia, Raymond VI, Saladin, Genghis Khan, and others). At this point, I’m hard-pressed to say what the overarching plot is. We spend the most time with a Praman (Muslim) secret agent who worms his way into the heart of Brothen Episcopal (Roman Catholic) power, but other major strands include Maysalian/Connecten (Cathar/Languedoc) politics, Devedian (Jewish) self-preservation (or possibly world-dominating conspiracy; I can’t decide whether it’s just our Praman/Muslim agent or Glen Cook himself who is coming off a bit anti-Semitic), and a healthy dose of Norse mythology. 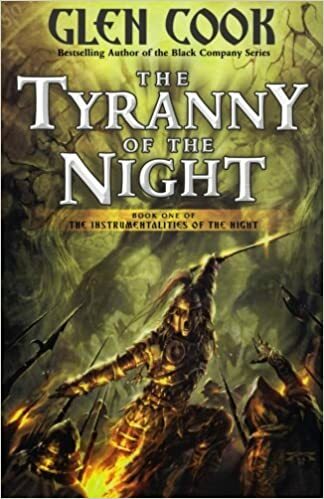 In spite of a few overly graphic bits (the crusading era was brutal and Rodrigo Borgia’s papacy was decadent and perverted) and an incredibly unfocused plot, I found this book fairly enjoyable. Cook mixes together vast swaths of history and a lurking dread of dark powers into something unique…messy but interesting so far.